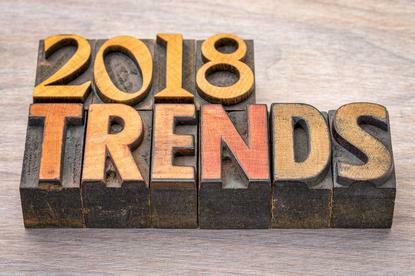 Getting a jump on the year to come, Gartner has taken a stab at the top strategic technology trends businesses and IT professionals should be on the lookout for in 2018. It should be noted that the analyst firm defines a strategic technology trend as one with “substantial disruptive potential that is beginning to break out of an emerging state into broader impact and use, or which are rapidly growing trends with a high degree of volatility reaching tipping points over the next five years”. "Gartner's top 10 strategic technology trends for 2018 tie into the Intelligent Digital Mesh,” Gartner vice president and fellow, David Cearly, said. “The intelligent digital mesh is a foundation for future digital business and ecosystems. "IT leaders must factor these technology trends into their innovation strategies or risk losing ground to those that do,” he said. Unsurprisingly, artificial intelligence (AI) makes an appearance in the analyst firm’s list for 2018, as do intelligent things and apps. Less expected is the inclusion of items such as the so-called ‘digital twin’, cloud to the edge, and continuous adaptive risk and trust. The ability to use AI to enhance decision making, reinvent business models and ecosystems, and remake the customer experience will drive the payoff for digital initiatives through 2025, according to Gartner. As a result, creating systems that learn, adapt and potentially act autonomously will be a major battleground for technology vendors through to at least 2020. "Investment areas can include data preparation, integration, algorithm and training methodology selection, and model creation. Multiple constituencies including data scientists, developers and business process owners will need to work together,” Cearly said. With AI becoming the next major battleground in a wide range of software and service markets, packaged software and service providers need to be thinking about how they'll be using AI to add business value in the form of advanced analytics, intelligent processes and advanced user experiences. According to Gartner, over the next few years, virtually every app, application and service will incorporate some level of AI. "Explore intelligent apps as a way of augmenting human activity and not simply as a way of replacing people," Cearley said. "Augmented analytics is a particularly strategic growing area which uses machine learning to automate data preparation, insight discovery and insight sharing for a broad range of business users, operational workers and citizen data scientists." On the subject of AI, the technology is already well on its way to driving advances for new intelligent “things”, such as autonomous vehicles, robots and drones, and delivering enhanced capability to many existing things, like connected consumer and industrial systems. “We are likely to see examples of autonomous vehicles on limited, well-defined and controlled roadways by 2022, but general use of autonomous cars will likely require a person in the driver's seat in case the technology should unexpectedly fail," Cearly said. "For at least the next five years, we expect that semiautonomous scenarios requiring a driver will dominate. During this time, manufacturers will test the technology more rigorously, and the nontechnology issues such as regulations, legal issues and cultural acceptance will be addressed,” he said. This refers to the digital representation of a real-world entity or system. In the context of internet of things (IoT) projects, digital twins are particularly promising over the next three to five years, according to Gartner. The analyst firm suggests that well-designed digital twins of assets have the potential to significantly improve enterprise decision making, with digital twins linked to their real-world counterparts used to understand the state of the thing or system, respond to changes, improve operations and add value. "Over time, digital representations of virtually every aspect of our world will be connected dynamically with their real-world counterpart and with one another and infused with AI-based capabilities to enable advanced simulation, operation and analysis," Cearly said. Edge computing puts information processing closer to the source of the information being processed. According to Gartner, connectivity and latency challenges, bandwidth constraints and greater functionality embedded at the edge favors distributed models. While cloud and edge may sometimes be viewed as competing approaches, the former is a style of computing where elastically scalable technology capabilities are delivered as a service and it doesn’t inherently mandate a centralised model. For Gartner, this means the two technologies could work well together. "When used as complementary concepts, cloud can be the style of computing used to create a service-oriented model and a centralised control and coordination structure with edge being used as a delivery style allowing for disconnected or distributed process execution of aspects of the cloud service," said Cearly said. Gartner predicts that over the next few years conversational interfaces will become a primary design goal for user interaction and be delivered in dedicated hardware, core operating system features, platforms and applications. This means that conversational platforms are likely to drive the next big paradigm shift in how humans interact with the digital world. The virtual reality (VR) and augmented reality (AR) market is currently adolescent and fragmented, in Gartner’s view, even if the novelty value is high. To drive real tangible business benefit, enterprises should be examining specific real-life scenarios where VR and AR can be applied to make employees more productive and enhance the design, training and visualisation processes. Mixed reality, on the other hand, is emerging as the immersive experience of choice, providing a compelling technology that optimises its interface to better match how people view and interact with their world. As such, it represents the span of how people perceive and interact with the digital world. The hype surrounding blockchain has been largely focused on the financial services industry, but blockchain technology have many potential applications, including government, healthcare, manufacturing, media distribution, identity verification, and supply chain. Although the technology holds long-term promise and may yet create disruption, blockchain promise outstrips blockchain reality, according to Gartner, and many of the associated technologies are likely to remain immature for the next two to three years. That said, Blockchain still offers a radical and tangible departure from the current centralised transaction and record-keeping mechanisms and can serve as a foundation of disruptive digital business for both established enterprises and start-ups. Business events may be anything that is noted digitally, reflecting the discovery of notable states or state changes. Such digital business events can be detected faster and analysed in greater detail with the use of event brokers, IoT, cloud computing, blockchain, in-memory data management and AI, according to Gartner. However, technology alone, without cultural and leadership change, does not deliver the full value of the event-driven model. As such, digital business drives the need for IT leaders, planners and architects to embrace event thinking. Indeed, central to digital business is the idea that the business is always sensing and ready to exploit new digital business moments. A continuous adaptive risk and trust assessment (CARTA) approach to digital business allows for real-time, risk and trust-based decision making with adaptive responses. Gartner suggests that organisations should adopt a CARTA approach if they want to securely enable digital business initiatives in a landscape of increasing advanced, targeted attacks, security and risk management requirements. As part of a CARTA approach, organisations should work to overcome the barriers between security teams and application teams, much as DevOps tools and processes overcome the divide between development and operations, the analyst firm said.